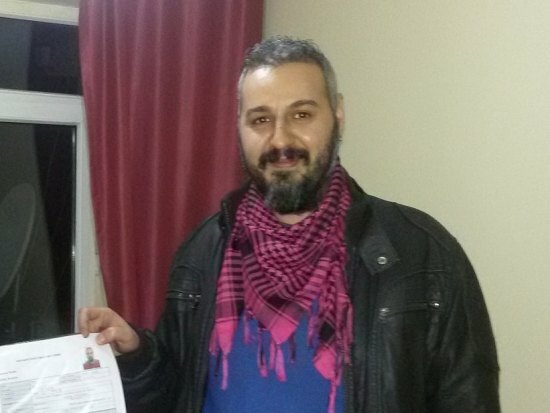 LGBTI activist Baris Sulu became a candidate for nomination from the pro-Kurdish People’s Democratic Party (HDP) for the general elections. Sulu spoke with kaosGL.org about the political representation of LGBTI people and the resolution process. First of all, I am somebody who thinks that the LGBTI people need to be involved in politics. Boysan Yakar, Sedef Cakmak, and Tuna Sahin’s assuming of municipal positions in the aftermath of local elections made me more hopeful. I thought another step was now needed. Therefore, in order for different things to be talked about, subjects must articulate themselves. You mean you give more importance to the presence of LGBTI representatives in the parliament rather than representatives who speak up against homophobia and transphobia? This is one of the gains of the LGBTI movement, the fact that recently many representatives are proposing bills related to LGBTI people. No matter how much they try to articulate some issues, the political representation of LGBTI people, their presence in the parliament is more important. What I say [as an LGBTI person] will be perceived differently. Why the Peoples’ Democratic Party (HDP)? I was there during the Peoples’ Democratic Congress (HDK). All groups suffering discrimination articulated their issues together. For instance, during the HDK’s first opening meeting, people were welcomed in 20 different languages. There are so many different cultures, different groups of people in Turkey and they all come together, listen to each other’s problems and commit to voicing them. My candidacy from HDP has to do with this. For, there, subjects are articulating their own discourse. For example, there are LGBTI committees. It is LGBTI people who articulate their issues within these committees. It is because of this that many projects are being carried out. There was so much productivity which led to an LGBTI workshop in Istanbul on February 21st. Co-President Figen Yuksekdag also participated. The highest level of representatives were able to participate, come up with suggestions, listen to what can be done, and talk together. This is what’s important. How do you assess the debates about whether the HDP will be able to pass the 10 percent electoral threshold? I say it will pass the threshold, because that really appears to be the case. Ultimately, the Republican People’s Party (CHP) and the Nationalist Movement Party (MHP) are very weak as opposition. It is the HDP that is being talked about. This makes me think that it is being discussed so much because it is in a situation where it can pass the threshold. It is said that a new period has begun in the Kurdish resolution process in the wake of a call for disarmament from jailed leader of outlawed Kurdish Workers’ Party (PKK) Abdullah Ocalan. What significance do LGBTI rights and freedoms have in the context of the resolution process? There are groups that society needs to make peace with. Society needs to make peace with the LGBTI people as well. We need to be rid of discourses we have been hearing so far that say “This is a 99% Muslim country, society has general rules, general morality” and so on. LGBTI people are oppressed within the heterosexist system, a system where heterosexuality is imposed and we need to make peace with these individuals. We should be reading the resolution process in this light. Just as Turkey as a society needs to make peace with Kurdish people, they need to make peace with LGBTI people. We can read “peace” in these terms in the context of the resolution process. Ali Erol from Kaos GL Association has a saying. He says “End the undeclared war against the LGBTs!” Society must make peace with us, too. Because we, too, live in this society. We walk past you when you were walking, our shoulders brush, we are that close. When you take public transportation, perhaps that person sitting next to you is gay. You are never aware of this. We have problems because you never see us, hear us, and you act as though we do not exist. Stop this undeclared war. You are participating in the Politics School organized by SPoD LGBTI (Social Policies, Gender Identity and Sexual Orientation Studies Association). How is the program? What have you discussed so far? The School of Politics will continue until Wednesday. It is going very well, very intense. We discussed perception of democracy, the political representation of LGBTI people and how to articulate their rights demands. We are learning very technical things actually, like in a camp, which is quite good. After we say we are victimized, we are lacking in our efforts at the point of demanding our rights. We repeat these continuously, but we need to rid ourselves from the victim psychology and remind that we are citizens, paying taxes, needing access to health services. At the Politics School, we discuss a range of topics from politics, how to do politics to being a citizen. If you enter the parliament, what kind of a path do you think you will follow for the recognition of LGBTI rights? The new constitution process is quite stuck in the matter of LGBTI rights. LGBTI people have a demand, the recognition of sexual orientation and gender identity in the constitution. First, I think this has to continue. Next is hate crimes. Sexual orientation and gender identity were removed from the hate crime statue. LGBTI people are a group most affected by hate crimes and perhaps the group who introduced the concept in Turkey. Bam! We were kicked out, in a very easy way! We need to focus on this.